It's obvious to you that something is wrong with your garage door. However, the problem may not be easy to detect. That's because your garage door system has several components that have to work together to make it properly go up and down. If even one element malfunctions, it could affect the overall operation of your garage door. Discount Garage Door Repair will provide you with a thorough assessment of your overhead door. Often, we find that the door's springs are causing the trouble. We make your door operate like new with garage door spring repair in Frisco, TX. Remember, a properly functioning garage door ensures that you have access to and from your home whenever you're in the car. Many families use their garage doors as their front doors these days for easy access and convenience. When something isn't operating correctly, it can mean you and yours have to change the way you enter and leave your home. Rely on us to accurately locate problems with your garage door springs and to make the necessary garage door repairs. 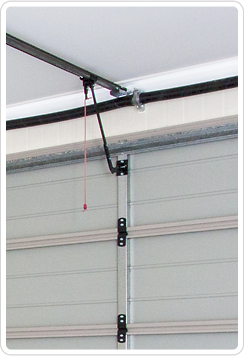 Garage door springs are essential to the overall operation of your overhead door. They make it easy for you to raise and lower the door whether you do it manually or with the electric door opener. A garage door that won't stay in place when it's completely up or mid-level along with gaps between springs are both indications of problems with your garage door springs. Most doors have either torsion springs or extension springs. Although both types are designed to last for nearly 10 years, they can fail prematurely. This leads to a malfunctioning garage door that could also be a safety hazard. Experts recommend that you never attempt to fix your own garage door springs because they can be dangerous. You should always rely on reputable technicians like ours to do garage doors spring replacement. We are knowledgeable about different doors and the best types of springs that work with them. If you were to attempt to replace your own garage door springs, you might choose the wrong ones and make the damage worse. We measure the diameter and the length of each spring to make sure that we replace it with one that has the same measurements. Your garage door performs optimally after we complete the job. Contact us for garage door spring repair that makes your door easier to operate. We proudly serve Frisco, Plano, Mckinney, The Colony, Prosper, Aubrey, Lewisville, Little Elm, and Allen, TX and the surrounding areas.